Knowing how cells exert force and sense mechanical feedback in their microenvironment is crucial to understanding how they activate a wide range of cellular functions, such as cell reproduction, differentiation and adhesion -- basic physiological processes that underlie embryo development, tumor metastasis, wound healing and many other aspects of human health and disease. Now a more fine-grained picture of adhesion mechanics is emerging, thanks to a new tool developed in Illinois in recent years called a "tension gauge tether," which allows scientists to measure cell mechanics at the single-molecule level. This week at the Biophysical Society 59th annual meeting, being held Feb. 7-11, 2015 in Baltimore, Md., University of Illinois biophysicists are reporting a new picture of cell adhesion mechanics they liken to a famous Hans Christian Andersen fairy tale. "Cells in our study are just like the princess in the fairy tale 'The Princess and The Pea,'" said Mehdi Roein-Peikar, the lead researcher and an orthodontist in Taekjip Ha's team at the University of Illinois at Urbana-Champaign physics department. Ha and Xuefeng Wang developed the tension gauge tether tool in 2013. "Although there are many layers of mattresses on a bed, that is, hundred thousands of weakly anchored ligand molecules are around a cell, the cell still could sense the tiny 'pea'--the one or two strongly anchored molecules beneath its body," Roein-Peikar said. "We find that cells can sense the mechanical property of their environment at the level of single molecules." The tension gauge tether was first reported in the journal Science in 2013. 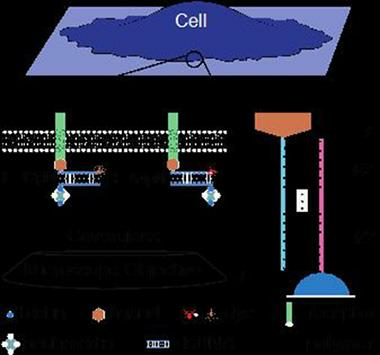 The technique is designed to detect and measure the molecular force in the single-molecule interaction by which human cell receptors are activated. The approach repurposes DNA strands as tethers that link ligand molecules to a surface. The tethers have defined tension tolerances and will burst if tension above their tolerance is applied. The integrin-ligand bond activates cells' adhesion to a surface only when the DNA tether does not rupture, enabling a measurement to be taken of the molecular force. "In our prior studies, tension gauge tethers with different tension tolerances were individually presented to cells, and we found the universal threshold force for integrin-mediated cell adhesion is around 40 pico-Newtons," Roein-Peikar said. This threshold means cells can't adhere to a surface if the tension gauge tether tolerance force is less than 40 pico-Newtons. According to Roein-Peikar, tension gauge tethers with different tension tolerances represent different types of ligands. In reality, integrins interact with a variety of ligands. To better imitate cells' real environment in human body, researchers evenly mixed weak (rupture force of 12 pico-Newtons) and strong (rupture force of 54 pico-Newtons) tension gauge tethers and studied cell adhesion in the multiplex scenario. In the multiplex experiment, researchers arrayed three circular spots of tension gauge tethers on the same surface, representing weak, strong and multiplex tethers. The weak and strong tethers were labeled with the spectral distinct dyes and distinguishable from each other under a fluorescence microscope. "When cells land on these surfaces, they will sense the mechanical characteristics of the environments and change their properties correspondingly," Roein-Peikar said. For example, if the tension gauge tethers on the surface are strong, cells will adhere to the surface and rupture the tethers only at the periphery of landing areas, leaving fluorescent footprints dark at the periphery and bright in the middle, called an "edge rupture pattern" by researchers. On the other hand, if the surface's tethers are weak, the cells will rupture all their tethers and not adhere to the surface at all, leaving uniformly dark footprints. But for a surface with multiplex tethers, scientists found that with only one to two molecules of strong tethers among hundreds of thousands of weak tethers beneath a cell, the cell can adhere to the multiplex surface, leaving footprints like on an all-strong-tether surface, rather than on a weak-tether surface. "This finding reveals cells' ultra-sensitivity for strong single molecule forces in the environment during adhesions," Roein-Peikar noted. "Even mostly surrounded by weak tethers, cells still can sense the mechanical property of their environment at the level of one or two single molecules." He said that genetic and morphological heterogeneity within populations of animal cells is an emerging phenomenon and has been observed in tumor populations. Often, the drivers of the collective population behavior are only a subset of cells. For example, Roein-Peikar explained, metastasis (a way in which tumors spread and one of the most damaging characteristics of cancer) is often decided by the actions of a subset of cells within a tumor population. The discovery of cells' ultra-sensitivity for mechanical property of their environment is crucial to understanding basic physiological processes that underlie embryo development, tumor metastasis, wound healing and many other aspects of human health and disease. Roein-Peikar also noted that their experiments are mainly based on Chinese Ovary Hamster cells, a cell line derived from the ovary of the Chinese hamster, often used in biological and medical research. However, not all types of cells in their experiments showed such sensitivity for mechanical environments. The researchers' next step is to study more cell types and reveal the mechanisms that set certain cells apart in terms of their ultra-sensitivity to single molecular forces. At the 2015 Biophysical Society Annual Meeting, the presentation, "The Princess and The Pea: a Story of Cell Mechanics" by Mehdi Roeinpeikar, Qian Xu, Xuefeng Wang and Taekjip Ha, will be given at 12:30 p.m., Tuesday, February 10, 2015, in room 314/315 of the Baltimore Convention Center.